Geoff: I thought of this based on a Finding Nemo picture reminding me so much of the cover of Aphex Twin's "The Richard D. James" Album. The shark's smile looked WAY too much like Richard. Paul: The strange person in the frame is my idol, Richard D. James. This is from the Aphex Twin, "Windowlicker" EP. Geoff: This guy is my avatar in a coupe forums. I like how he turned out. Paul: The very first picture to portray Twenty Bees Man. Mario: The very second picture to portray Twenty Bees Man. 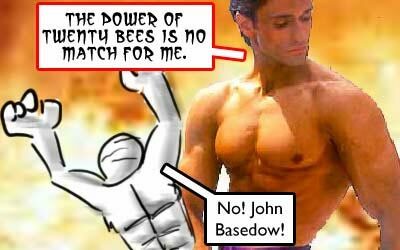 Just to put everyone's minds at ease, Fitness Celebrity John Basedow is not 20BM's main rival, though he probably ranks up there pretty high. He's certainly one of my rivals, because I hate him so. Mario: I intentionally only put 19 bees in this picture. Don't ask me why, 'cause I'll just stare at you with a crazed grin across my face for several hours, muttering the ingredients of 7-UP under my breath. Mario: I had to include ol' Walter. It's the law. Of physics.